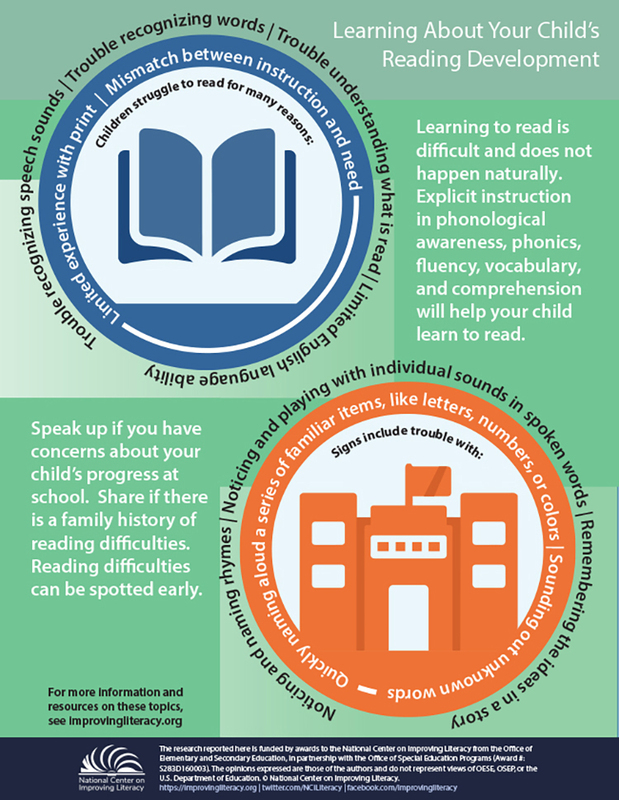 Learning to read is difficult and does not happen naturally. It requires explicit and systematic instruction, which is especially important for struggling readers. Learning to read involves many different skills that must be taught to your child. Instruction in phonological awareness, phonics, fluency, vocabulary, and comprehension will help your child learn to read. Young children often need explicit instruction in phonological awareness and phonics. Your child needs to be able to sound out words correctly and quickly to understand what she reads. As children get older, the need for this instruction typically lessens unless they continue to struggle with these skills. Teaching vocabulary and comprehension also begins when your child is young and continues throughout the school years. Your child’s reading comprehension can also improve when she writes about what she reads. Being informed about the parts of literacy, how children learn to read, and why they might struggle can help you make better decisions about your child’s education. Research shows that when schools, teachers, and families are well-informed, children make greater gains in reading and writing. How Do Children Typically Develop in Reading? Emergent readers (usually birth to age six) are learning our sound system and how print works, including letter-sound relationships, and the meaning of stories read to them. Early readers (usually age six and seven) are linking speech sounds to letters to make words, learning to decode words, and beginning to make sense of what they read. Transitional readers (usually age seven and eight) are usually reading “like they talk” and have strategies to help them decode words and read with understanding, but may still need support with more difficult reading material. Fluent readers (usually ages eight and up) are reading independently with confidence and understand longer and more difficult types of material. They use word parts to figure out words and relate sections of the story to one another. As fluent readers enter middle and high school, they often read material that has many viewpoints and more complex language and ideas. They draw on what they know from other reading material and experiences to judge what they read and come to conclusions. For milestones by grade level, please see resources in NCIL’s online repository. Reading difficulties are most common in the earliest stages of reading. Some children continue to struggle or show new difficulties in later grades. Children struggle to read for many reasons. They may have trouble with speech sounds, recognizing words, or understanding what they read. Reading may be hard because children have limited English language ability or experience with print. Also, instruction might not be matched to children’s needs. Schools often use a tiered system of learning support to help children with reading difficulties. Chall, J. (1983). Stages of Reading Development. New York: McGraw Hill. pp. 10-24. Hall, S.L., & Moats, L.C. (2002). Parenting a struggling reader: A guide to diagnosing and finding help for your child’s reading difficulties. New York: Broadway Books. National Assessment Governing Board. (2015). Reading framework for the 2015 National Assessment of Educational Progress. Washington, DC: U.S. Department of Education. This parent guide provides information for helping children learn to read in preschool through grade 3. Read a parent guide that provides information for helping children learn to read in preschool through grade 3.